Providing and installing security systems & burglar alarms, Lincolnshire | Smith Security are experts in CCTV cameras and access control installation, based in Louth and serving the county. Covering Lincolnshire and surrounding counties Smith Security UK Ltd plan, design and install simple to enhanced security systems, from only burglar alarms to fully fledged CCTV and electrical entry systems, to meet all the security needs for both domestic and commercial clients. Over time, Smith Security has gained an unrivalled reputation for quality and service and many of the company’s new clients are gained from referrals and recommendations. Smith Security UK Ltd is SSAIB APPROVED for Intruder Alarm and CCTV Design, Installation and Maintenance. Steve designed and installed a system that both met our expectations and needs in a timely and efficient manner, we have been very pleased with all the work done. Simply awesome. Steve what would I do without you? If I had a supplier of the year competition you'd win it hands down. No nonsense, practical, dependable service. 110% recommended. Expert installation of burglar alarms and intruder sensors, with equipment chosen for superior reliability and easy of use, using GSM cellular technologies and police response available. We supply and install both analogue and digital CCTV security camera systems, including cameras with high definition output and network cameras that can be integrated into your current security system. We supply access control systems, including electronic barriers and electrical gates. We choose the equipment to be as sturdy and reliable as possible and can fit for both domestic and commercial customers. 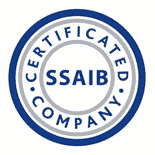 SSAIB is a leading Certification Body offering a wide range of schemes for providers of electronic security, fire systems and guarding services in the UK. Their aim is to promote and maintain high standards within the security sectors and to provide recognition for those who achieve them. We strive at all times to provide the very best alarm and security system for your budget and premises. We use only quality systems from well know manufacturers with an excellent track record. You home & business protected 24/7 - in a lot of cases, with reduced contents insurance premiums. CCTV camera systems provide an accurate record of intrusion attempts and can play a major role in the recovery of stolen goods. Extensive knowledge and expertise in security access control. Competitive prices and an honest, reliable service.